The inside of a computer is a bad place full of electricity and sharp edges. From you is discharged through the earth. The inside of most computer cases are unfinished metal and has very sharp edges so be careful. Then unplug all the cables from the back of the computer as you remove them make a note where they came from. (So when you finished you can put them back). 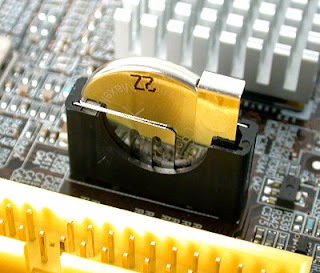 Some computer cases only require you to remove 2 screws on one side then a panel can be removed allowing you access to the computers insides, others you must remove 6 screws and remove the whole case by sliding it to the rear and lifting it off. Now make sure that you read the safety instructions about static. Look inside you will see a round silver thing that looks about the size of a 10p piece (quarter). This is the battery itself, carefully lift the retaining clip and slide the battery out. That’s it removed now go to your local computer retailer, electrical retailer (Tandy/Radio shack) taking the old battery with you and get a new battery. Back to your computer insert the new battery by lifting the clip and sliding the battery in. Turn on your PC. You will now need to go into you bios…. Right the bios is the god of your computer. To access it, when your computer first starts you will see a black screen with white text. If you look carefully you will see a line that says something like "press del for setup" or some other key (F2 or ESC or tab) this will take you to god's house where you can make lots of changes to the way your machine works. It is also the place where you can make your nice computer in to a rather expensive door stop so be careful and don’t go playing with anything. You will now be presented with a blue screen with a lot of options on it, the one we want is Load Optimised / Default settings. 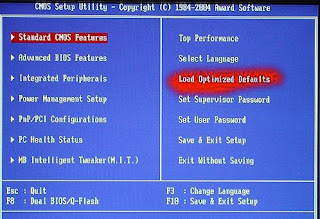 Press the F10 key for save setting and type Y, the computer should now reboot. If every thing went well then your computer will now be up and running. 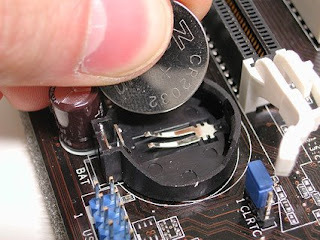 Lay it on it's side and remove side cover to expose Motherboard. Take any thin object, "small screwdriver, knife point, wood shiskabob skewer. Pull back the battery retaining clip. Toss the old battery in the junk receptacle, unless you belong to Greenpeace and want to save the earth. Install the new battery. 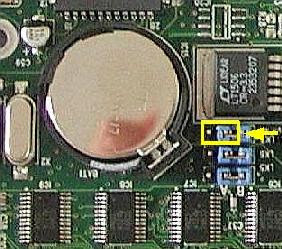 No need to reset bios becasue the compter supplies voltage to the CMOS while it is running. Reset or resync clock with internet. Done!